In a world of commonplace horrors, how do we talk about the refugee crisis? All summer, the news has broadcast images of overloaded boats, discarded life-jackets, and dead children on Mediterranean beaches. When the violence of inequality becomes ordinary, we no longer imagine alternatives. 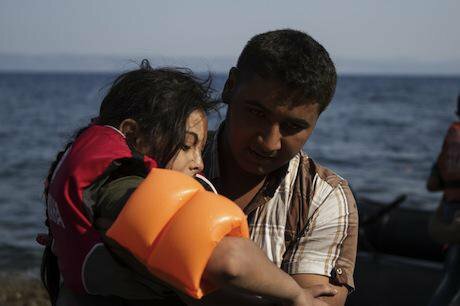 Refugees arrive on Lesbos, August 2015. Demotix/Tasos Markou. All rights reserved. Jehan Bseiso, "No Search, No Rescue", 2015. Reading the news this summer has involved negotiating similarly jarring images: people desperately paddling towards Mediterranean beaches on overloaded dinghies while tourists sunbathe amidst the flotsam of failed crossings, and the growing piles of discarded lifejackets. In contemporary Europe, previously segregated images of tourists and migrants are now captured within the same visual frame. “It is surreal”, Greek photojournalist Yannis Behrakis commented, witnessing the "migrants arriving on the beach each day among tourists and posh hotels". This year alone, we know that at least 500,000 people have made their way to Europe by perilous sea-crossings, and an estimated 3000 of these have drowned en route. And let us be clear: this ‘refugee crisis’ is really a crisis of international borders, neo-colonialism, and imperialism. European border-control policies turn voyages to safety, freedom, and opportunity into treacherous and sometimes fatal journeys. As one British journalist wrote: "they were murdered. Actually, they were massacred. The policy stipulated they should be left to die. So they died". British news media perspectives on these Mediterranean beach scenes have swayed between the apparently distinct poles of xenophobia and humanitarianism. Newspapers have featured many stories about family holidays ruined by “thousands of boat people from Syria and Afghanistan” who have turned the Greek islands into a “disgusting hell hole”. This kind of language classifies and devalues, drawing distinctions between those whose lives are of value and those who are dispensable. Alongside this genre of racist reportage, there are stories of ‘humanitarian tourist heroes’, like Sandra Tsiligeridu, ‘a former Greek model’, who rescued a Syrian man, Mohammed Besmar, on her way back from a snorkelling trip. Tsiligeridu “was cruising back to the Greek holiday island of Kos with family and friends […] when she spotted something out of place in the sea up ahead. A pair of hands appeared to be waving at her from the deep-blue waters of the Aegean Sea”. These adventure stories are bound up with the redemption of the European saviour. Journalists reported Tsiligeridu as saying, "Before I met Mohammed I was angry and sad at the scenes I saw on television. I asked myself, why do they come here? Now I understand the value of human life". As Teju Cole wryly notes, “the white savior supports brutal policies in the morning, founds charities in the afternoon, and receives awards in the evening”. These two genres of reporting, ‘humanitarian-saviour’ and ‘racist-xenophobia’ often appear alongside each other in the same newspapers. Flipsides of the same coin, they both represent and shape European perspectives on the current crisis at the borders, in which migrants are imagined as alien others, whether ‘deserving refugees’ or ‘illegal migrants’. Mail Online. Fair use.In response to overt and implicit anti-migrant racism in coverage of the life-and-death struggles taking place at Europe’s borders, there have been calls for more care in how this unprecedented exodus of people is described and represented. This has led to what one BBC news headline describes as a "battle over the words used to describe migrants". The logic behind Al Jazeera’s decision is that the term ‘refugee’ has a specific international legal genealogy enshrined in the 1951 United Nations Convention Relating to the Status of Refugees. However, this rationale fails to recognise the fundamental erosion of both the legal status and popular meaning of the terms ‘refugee’ and ‘asylum-seeker’ in contemporary Europe, which has accompanied the tightening of legal migration channels. Since the 1990s, European and other wealthy states have shirked their international obligations as signatories to the 1951 convention through creating new legal classifications that diminish refugee rights. For example, the small number of Syrian refugees which Britain has agreed to house will be granted ‘humanitarian protection status’ for five years, after which time they will either need to apply to remain longer, leave, or be forcibly deported. In other words, Britain is actually accepting no Syrian refugees at all. In other words, Britain is actually accepting no Syrian refugees at all. Further, Europe and other wealthy countries in the world have implemented policies and programmes designed to keep refugees at bay so they cannot land to make asylum-claims. These include the proliferation of regional and transnational deterrence measures, such as the off-shoring of detention facilities and other nefarious arrangements with transit states, which “block safe and legal routes” of travel in order to prevent people from arriving to make asylum-claims. And the Hungarian government alone “has invested more than 100 million euros on razor-wire fencing and border controls”, transforming itself into what Amnesty International describes as “a refugee protection free zone”. In September, the United Nations Refugee Agency (UNHCR) launched a #WordsMatter campaign. In a film to accompany the campaign, celebrities explain that the UNHCR distinction between a refugee and a migrant hinges on ‘choice’: a migrant chooses to move, while a refugee has no choice, is fleeing persecution. While the campaign is intended to destigmatise the term refugee, it also renders refugees as passive: they are both invisible and voiceless in this film, ventriloquized by celebrity talking heads. Within this false distinction between refugees who are ‘forced to leave’ and migrants who have ‘chosen’ to cross borders, refugees emerge as “as dependent, apolitical non-agents”. The insistence on distinct differences between classes of people on the move mystifies the “historical forces, politics, power, hegemony, economic exploitation and colonialism” that dispossess people from their homes and livelihoods – hence the call of self-organising refugees in Kurdistan to ‘Forget the UN!’. We can see the impact of this distinction between deserving and undeserving migrants in the fragile political consensus that something must be done for Syrians (authentic refugees), whilst those who have made perilous journeys from ‘forgotten conflicts’ in Africa (Eritrea, Nigeria, Somalia, Sudan, Gambia), South Asia (Afghanistan, Pakistan, Bangladesh), or the Western Balkans (Kosovo, Albania) are classified and criminalised as economic migrants. What is actually happening is a wide “competitive downgrading of refugee protection standards” in ways that sustain deeper global divides in wealth, rights, and well-being. The British historian and journalist Tim Stanley insists that “it is down to the state in which they have arrived to define what they are”. The “what” in this sentence is chilling, a reminder of the ways in which the bureaucratic classification of people operates through what Alexander Wehelyie terms “racial assemblages”: the socio-political processes through which humanity is disciplined into “humans, non-quite-humans, and nonhumans”. The Dispossessed. RA.AZ/Flickr. Some rights reserved.In The Dispossessed, the school children on Anarres are not shocked by the film they watch. It transpires that this is a tired lesson, and they speculate amongst themselves about whether life on Urras is as “disgusting, immoral [and] excremental” as their teachers would lead them believe. Yet, when the protagonist of The Dispossessed visits Urras as an adult, he discovers precisely the world of “commonplace horrors” he was taught about as a child. So horrific is the inhumanity he witnesses, that he has no language, no words, with which to comprehend and describe it. When the violence of inequality becomes ordinary, we can no longer comprehend it or imagine alternatives. For Europeans, photographs and television footage of migrant arrivals, of rescues at sea, of overloaded boats, discarded life-jackets, lost objects and dead children on Mediterranean beaches are rapidly becoming commonplace horrors. When the violence of inequality becomes ordinary, we can no longer comprehend it or imagine alternatives. The political response to build higher walls and fences, to build prisons and camps, and accelerate deportations will only exacerbate the vulnerabilities faced by 60 million displaced people. It is not the movement of people that is the problem. The violence of global apartheid is the problem. Global apartheid more accurately describes the refugee crisis we are witnessing. In its vocabulary of apart-ness, it relies on stigmatization and racialization to produce seemingly natural differences between ‘them’ and ‘us’. This language operates in tandem with practices of physical segregation, fortification and militarization of boundaries, detention and expulsion. Yanis Varoufakis recently observed that, “looked at from space…borders are an absurdity”. Of course we need to fight for refugee rights. 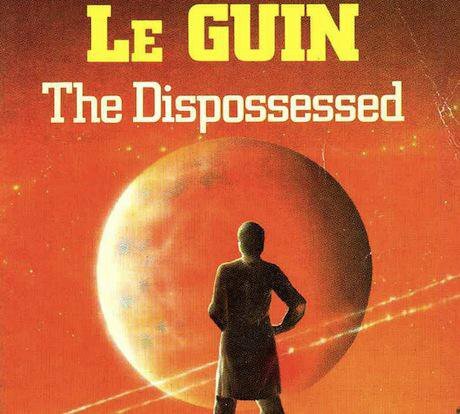 But taking our cue from the political allegories of Le Guin’s science fiction, we must also nurture more radical alternative perspectives on this crisis, so that we understand its strangeness, and its horror.